Cardinal Symphony is a proposed skyscraper planned for construction in the downtown region of Miami, Florida. The tower is one of several new residential towers proposed for the city. If completed, the building would stand at 600 feet (183 meters), with 60 floors. The tower has an estimated completion date of 2010. Cardinal Symphony is a part of the recent Manhattanization wave that is taking place throughout Miami. City Square is a proposed 10-acre project by Maefield Development, located in the heart of Miami’s Entertainment District Miami, Florida. City Square is a three-phase, mixed-use project, which will include retail, an 11-story parking garage, two media structures, and a bay-facing residential tower on ten acres. Columbus Centre is a proposed skyscraper planned for construction in the Coral Way neighborhood of Miami, Florida. The tower is one of several residential towers proposed for the city. With a planned height of 710 feet (216 meters), the building would stand as one of the tallest in Miami if completed. The tower has an estimated completion date of 2010, and would rise 56 floors. Columbus Centre is a part of the recent Manhattanization wave that is taking place throughout Miami. The Eagle Garage Tower is a high-rise building planned for construction in the downtown region of Miami, Florida. It has been approved by the City of Miami, and is scheduled to begin construction in late 2007. If completed, the building would rise 425 feet (130 meters), with 42 floors. The Eagle Garage Tower is one of several new residential developments taking place in Miami, and is a part of the city's recent Manhattanization wave. The Empire World Towers are two proposed supertall skyscrapers to be built in Miami, Florida in the United States. The complex consists of the Empire World Tower I and the Empire World Tower II. If completed, both towers would stand at 1,022 feet (312 m), with 93 stories each. 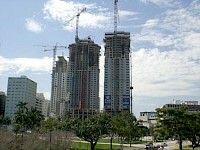 They would surpass the Four Seasons Hotel Miami and become the city's 2nd tallest buildings, behind One Bayfront Plaza. Everglades on the Bay is an urban development in the City of Miami, Florida, United States. It is located in northeastern Downtown, and forms part of the Biscayne Wall, a series of skyscrapers visible from Biscayne Bay along the west side of Biscayne Boulevard. It consists of two residential skyscrapers, North Tower and the South Tower as well as a retail center. The buildings were topped out (reached full height) in 2007, and were completed in early 2008. The Four Seasons Hotel and Tower, also known as the Four Seasons Hotel Miami or simply the Four Seasons Tower, is a skyscraper in the City of Miami, Florida, United States. It is located in Downtown Miami's Brickell Financial District. The tower contains a Four Seasons Hotel, office space and several residential condominium units on the upper floors. Rising 789 feet (240 m) and 64 floors, it is the tallest building in Miami and the state of Florida. The Freedom Tower is a historic 1925 landmark building in Miami, Florida, that serves as a memorial to Cuban immigration to the United States. It is located at 600 Biscayne Boulevard on the Wolfson Campus of Miami Dade College. On September 10, 1979, it was added to the U.S. National Register of Historic Places. It was designated a U.S. National Historic Landmark on October 6, 2008. 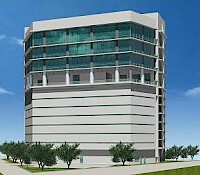 Highland Park Center is the first and one of the largest Green office buildings in Miami, FL. It is located at 1001 Sunnybrook Rd. Miami, FL. 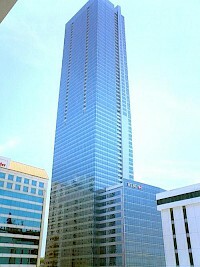 From street level, the building is 166 feet tall and contains 16 floors. It is set to become the only Silver certified building in Miami. It was designed by Robert Swedroe. The building is one of the first office buildings in Miami, to be constructed of recycled concrete, drywall, and wood.